WW2 - The Second World War: "Just taking the girls home from a dance"
The following article about a young farmer - also a gallant member of the Home Guard - accompanying two young ladies to a dance appeared in 'The Whitehaven News' (March 1945). The farmer's name and full address are not included. W_________ W________ (29), farmer, H_____ _______, Bassenthwaite, was fined 20s, plus 1s costs, at Whitehaven Court on Thursday for misuse of petrol at Beckermet at 12-15 a.m. on February 17. Defendant pleaded guilty. 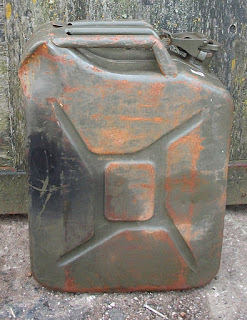 For the prosecution it was stated that the defendant, who was a member of the Home Guard and received petrol for his duties, had some petrol left in his tank when the Home Guard "stood down." Defendant then applied for petrol use on farm business and while waiting for his application to come through a farmer's meeting, which he wished to attend, was held at Bigrigg. Defendant attended and also the dance which followed. After the dance he took two young women home to Beckermet and that was when the offence was committed. Defendant told the Justices that he had been to Beckermet for tea, having been unable to obtain it at the meeting, and while there he met two friends, whom he took to the dance. Defendant said he understood they were able to get transport back at night, but when he found they could not do so he took them home rather than see them stranded." It would seem that when this gallant young farmer was taking his two young lady friends back home from the dance he had ben stopped by the law. "Just taking the girls home from a dance, officer"? Well, this was not going to prevent our gallant farmer from being charged and then appearing before the local magistrates. One might have a little smile at this seemingly strange, but true, tale of WW2. Hopefully, the music and dancing were enjoyed by all!